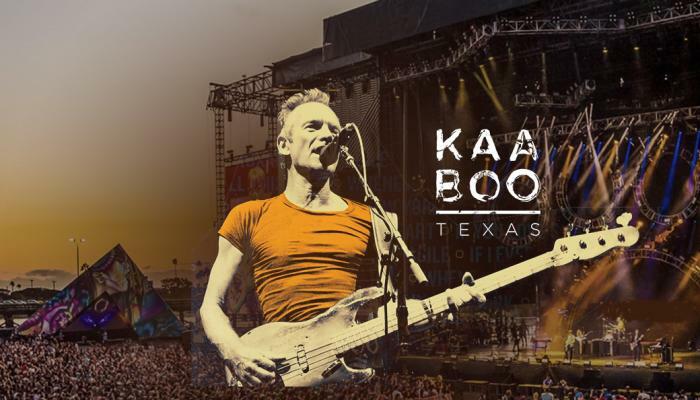 KAABOO Texas rocks Arlington, May 10-12, with a diverse lineup of classic and contemporary artists. But, if you think that KAABOO is just a music festival, think again. This first-class event is an adult escape, uniquely curated to appeal to all five of your senses, with world-class music, hilarious comedy, incredible cuisine, craft libations, inspiring contemporary art, and personal indulgences. But, I digress. I believe a “good song” has a catchy hook or upbeat arrangement in addition to a lyrical resilience that tickles your imagination. That is why Gordon Matthew Sumner, otherwise known as “Sting,” is my favorite artist. Anyone who has heard his popular hits, like Desert Rose, Brand New Day or Englishman in New York, knows how toe-tappy he is, but one listen to Fragile or Russians reveals his poignancy. That combination of poetry and fun is what has made him commercially successful AND culturally relevant for so many decades. As for me, I am simply excited about singing along with the man who wrote the soundtrack of my life. Apparently, I am not the only one who fancies Anne Rice’s Vampire Chronicles! Sting was creatively inspired for this song one night when he felt that he was being followed in the French Quarter. “Oh you&apos;ll never see my shade or hear the sound of my feet while there&apos;s a moon over Bourbon Street,” says the character in the song, as he struggles to balance his new vampiric instincts while maintaining what’s left of his humanity. Goodbye is never easy. This isn’t one of Sting’s popular songs, but it is surely the pitch-perfect capture of the angst and indecision that are travel companions with any breakup. We listen as the heroine of the song, at long last, decides to slip away into the rain, leave her lover behind, and find a life that’s better. “In your imagination you&apos;re a thousand miles away, too many of his promises got broken on the way.” More interestingly, this song is told from the point of view of both parties involved in the split. Sting wrote these haunting lyrics in protest of Chilean dictator Augusto Pinochet, who killed thousands of people, via his regime, between 1973 and 1990. The video spotlights the mourning Chilean women who danced with photographs of their murdered or missing loved ones. “See their silent faces, they scream so loud.” The only thing more stirring than the lyrics is the slow swooning pipe melody. If you are daydreaming about a luxurious summer getaway for spa treatments, amazing music, and hip pool parties, join me, Sting and the rest of the lineup, May 10-12 at AT&T Stadium and let KAABOO Texas rock your world!